Flexible Tap Connection Pipes For Kitchen Sink, Basin and Bidet Monobloc Mixers. 15mm Connection Monobloc Mixer Braided Pipes. Variety Of Length Available. Plumbing Pipes For Bathroom and Kitchen. JSL Bathrooms. Bradford. Yorkshire. 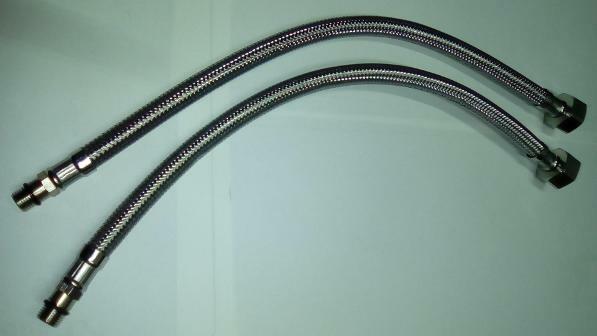 Flexible Tap Connectors Also Known As Flexi Pipes Are Braided Metal Reinforced Concealed Rubber Pipes For Connecting Taps And Toilet Cistern To The Water Supply. Having The property to be bendable enables easy application and fitting as well as not having to later existing pipework as much or at all. We don't specialise in Flexi Pipes, but we still have a small Selection at low prices, in stock.